The GROHE New Tempesta Cosmopolitan 160 shower system with thermostat for bathtubs is precision engineered to offer a new kind of showering enjoyment. The shower system contains a 160mm head shower, 100mm hand shower and a 1750mm Silverflex hose. With the GROHE AquaDimmer you can switch easily between the head shower (including soothing Rain Spray function) and the bath filler, while the diverter on the bath inlet activates the hand shower with two spray options – gentle Rain spray and an invigorating Jet spray. In both hand and head shower GROHE DreamSpray technology ensures that the flow from each and every nozzle will be just right. Its SpeedClean nozzles are designed to brush free of limescale with a simple wipe, and the durable but dazzling GROHE StarLight chrome finish keeps the whole set looking stunning. A super-insulated Inner WaterGuide prevents the surface from getting too hot, in order to protect both your sensitive skin and the lustrous chrome finish. The horizontal shower arm swivels through 180˚ to increase coverage, and the TwistFree feature means the shower hose never gets in a tangle.The thermostat is fitted with GROHE EcoJoy technology to cut water consumption, and the GROHE TurboStat function for precise control and a constant temperature, while the GROHE SafeStop button limits the water temperature to a maximum of 38˚C – great for giving children independence in the bathroom – but can be raised for adults. This safety feature is set at 38°C, preventing users – especially children – from turning up the temperature too high. You can easily adjust the SafeStop setting to temperatures over 38°C to suit your needs and preferences. GROHE EcoJoy® reduces water consumption by up to 50% without compromising on performance. Whenever you turn on your tap, you will enjoy a full jet of water while saving money nonetheless. Refreshing shower plus powerful cleaning action. 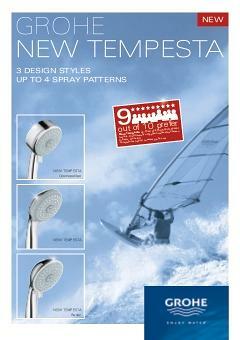 A Jet Spray shower is an instant burst of energy. The strong centred stream can be directed at any tense or knotted muscles to soothe away aches and leave skin deeply clean and revitalised. After your shower Jet Spray’s power can be applied to thoroughly cleaning the tub or shower stall. Switching between your bath spout and hand or head shower is easy with AquaDimmer, while also controlling the water volume in a single motion. The same handle also serves to turn the water flow on and off.